Explore, Learn, Have Fun! 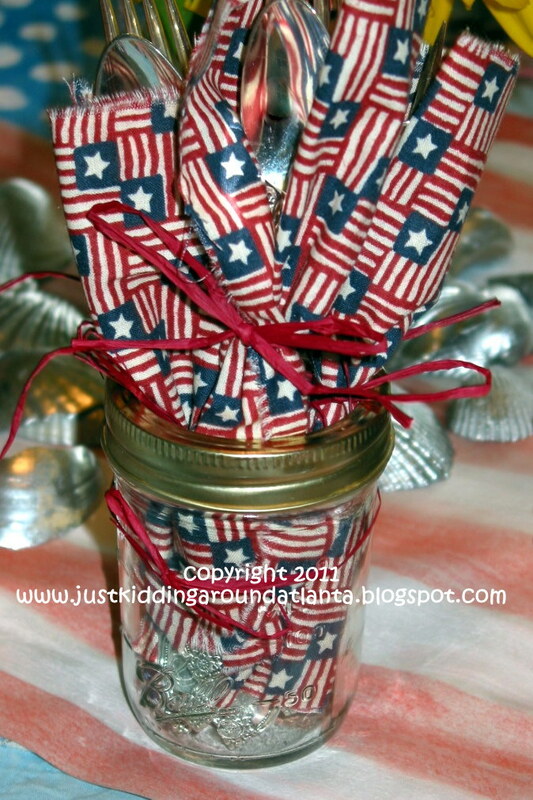 : How to decorate your 4th of July table! These garlands are so easy to make! They take time, but you can cut them and put them together while watching the kids play, or watching tv, listening to music, etc. I make these to sell on etsy and to give as gifts, but they also decorate our home. This patriotic garland is one of my favorites. I display it all summer! Use coupons to get your fabric at Hobby Lobby, JoAnn's or Hancock Fabric and you can make this for a great price. Or go AFTER the holiday and buy the fabric when it is marked down for clearance, and you make next year's decorations now! 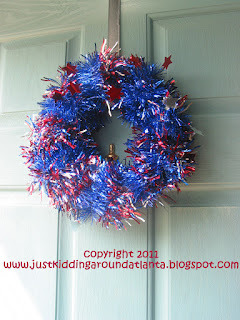 I made this easy red, white and blue wreath from Dollar Tree items. So easy and very festive! Fabric is such a simple thing to use in decorating for any holiday. Buy a yard of fabric with a fun, holiday pattern and cut it with pinking shears to make a table runner, napkins, basket liner or other decor. Tie a square of fabric around a mason jar using a coordinating ribbon or raffia, then fill with flowers, or use to hold silverware. Easy, cheap and festive! I like to use an old quilt as a tablecloth, too. Fabric is a lovely way to add color to your holiday table. Silverware bundled in fabric napkins, tied with raffia. Store in mason jars for easy access at meal time! 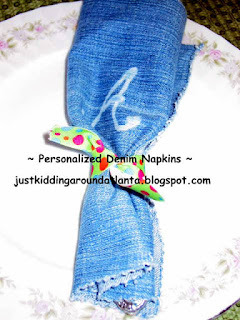 If you have kids, you probably have lots of old denim in your home! Some of it isn't fit for donating or consignment sales. But it is perfect for crafting! 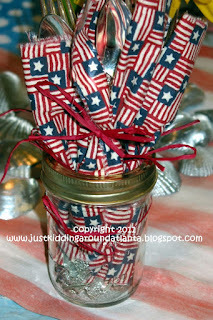 Make a basket liner, table runner, or napkins for your Fourth of July Celebration! Just tie yours with red, white and blue ribbon for a perfect look. In the pictures directly above, the flowers and shells are sitting on a flag created by one of my creative kiddos using chalk. 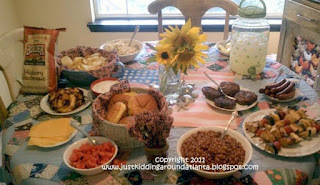 It was the perfect centerpiece for our table on the Fourth! Make several and you have placemats. You could do the same with fingerpaints, crayons, markers, etc. 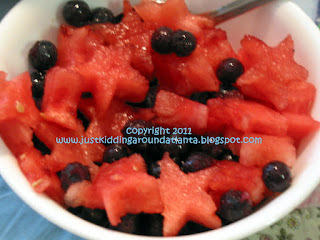 - just let the kiddos get busy creating something red, white and blue! Use cookie cutters, sprinkles, and other fun items in your kitchen to make ordinary food FUN! 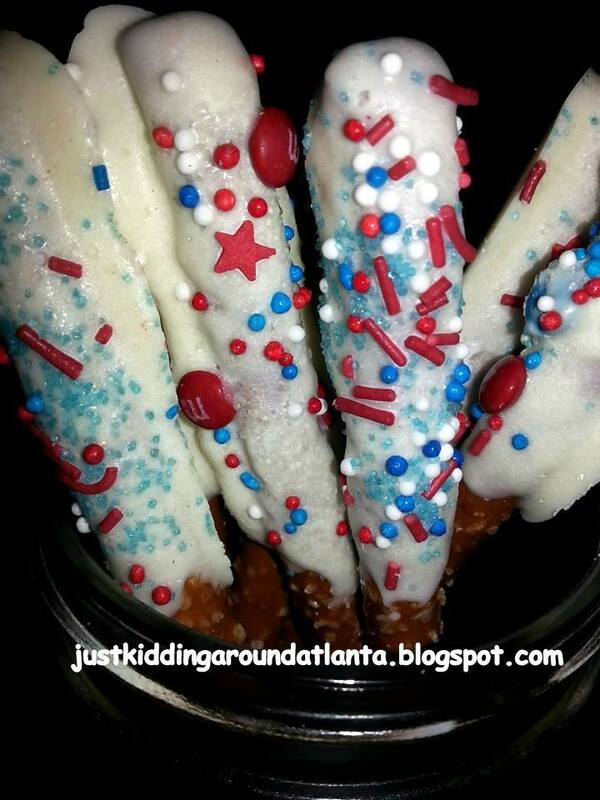 Dip pretzel rods in white chocolate, then decorate with sprinkles and tiny candies. Watermelon, apples, and pineapple are all perfect for cookie cutters. And don't forget lots of colorful foods! 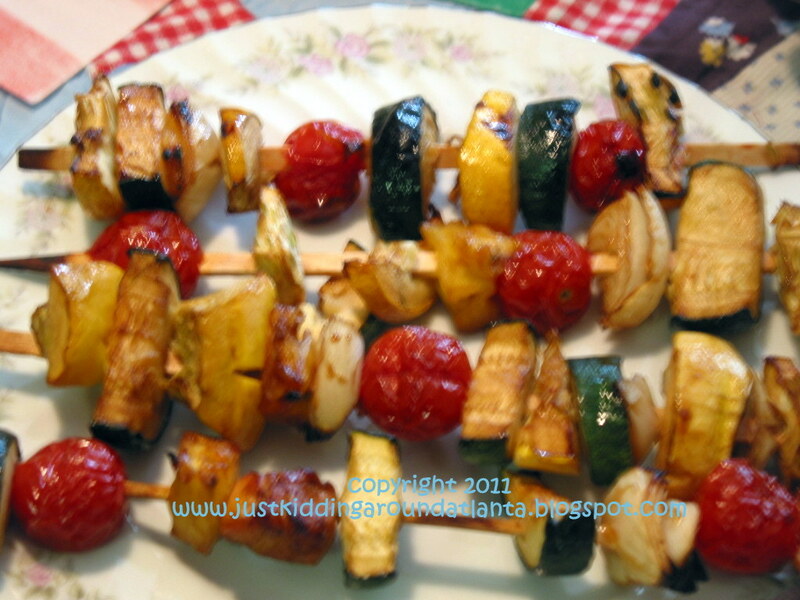 Veggie skewers on the grill are a perfect summer side dish. 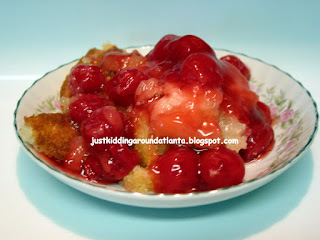 Another family favorite of ours is Cherry Krazy Krust Pie. Just top each serving with whipped cream and a few blueberries for the perfect red, white and blue dessert! Of course you can find ton of additional ideas on pinterest. If you like any of mine, please pin them by hovering your mouse over the image and then click the pinterest button that comes up! :) I hope you and yours have a wonderful weekend celebrating our great country. Thanks for stopping by! All of these are great ideas. 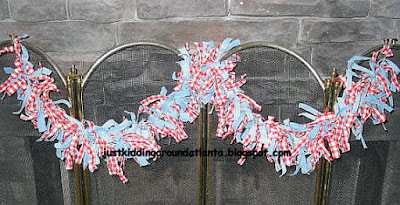 I like the Red/White/Blue Garland. Another favorite of mine is the Pretzel Rods dipped in White Chocolate with Sprinkles. Thanks for the great ideas. I love your garland! I grew up with my Mom always having a garland up for whatever holiday/season it was.